Infectious rhymes, sunny illustrations, and an array of baby animals make an irresistible page-turner for the youngest of listeners. Little readers are invited to join these baby animals as they fly, swim, wiggle, and slide, all with the help of their mamas. But what these babies like best, of course, is spotting other baby animals! 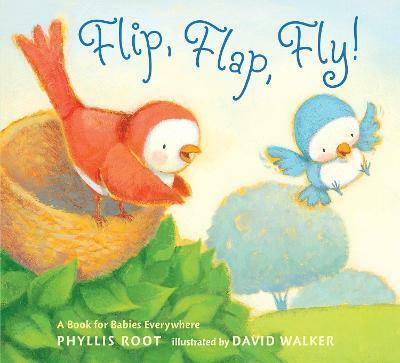 With the buoyant rhythms of Phyllis Root and David Walker's cheerful illustrations, here is a guaranteed favorite for babies and toddlers, who will love shouting out the rhyming word sure to come on the next spread. --Kirkus Reviews Engaging verses and winsome illustrations encourage little ones taking those first steps into the world. --Washington Parent The soft, warmly hued, acrylic art cheerfully invites young listeners to participate. Ready made for chubby hands to reach and point - and sure to bring requests of "Read it again!" Phyllis Root is the author of more than thirty books for children, including LOOKING FOR A MOOSE, OLIVER FINDS HIS WAY, and the BOSTON GLOBE-HORN BOOK AWARD--winning BIG MOMMA MAKES THE WORLD. She lives in Minneapolis. David Walker is the illustrator of several children's books, including DOMINO by Claire Masurel. He lives in Chapel Hill, North Carolina.